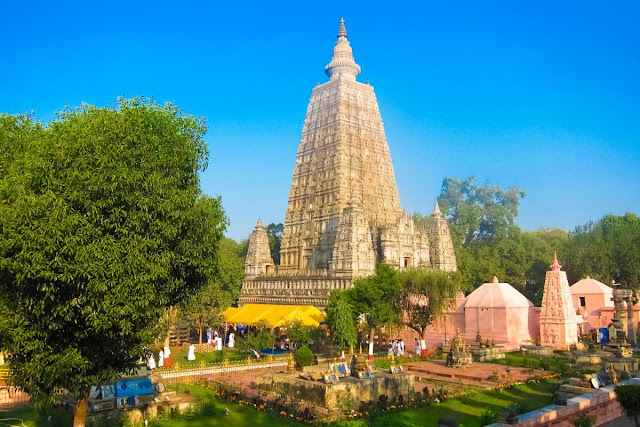 The magnificent Mahabodhi Temple Complex in Bodh Gaya is situated in the central part of the state of Bihar. The temple is about 96 km away from Patna, the capital city of Bihar. The first temple was constructed by King Ashoka in the 3rd century B.C. while the present temple complex is estimated to be erected somewhere between the 6th or 5th century B.C. The entire temple has been built only by using bricks, which is a sculptural masterpiece. The temple helps the devotees to get an insight about the life and teachings of Lord Buddha. The sacred Bodhi tree under which Siddhartha Gautama meditated and attained spiritual knowledge is situated on the west side of the temple. There are plenty of towers in the temple and the longest one is believed to be 55 meters tall. The gold painted idol of Lord Buddha sitting in the ‘Bhumisparsa Mudra’ (Earth touching posture) captivates the attention of the visitors. The devotees can also visit seven other places located inside the temple complex where Lord Buddha used to meditate after getting enlightenment. The premises of the temple include several smaller stupas and Buddha statues. Some of the idols are believed to hundred years old. The history of Bodhgaya is about 2500 years old. In the sixth century B.C., prince Siddhartha Gautama attained supreme enlightenment at this holy place and became the Buddha. In commemoration of this event, emperor Asoka set-up the Vajrasana (Diamond Throne) of polished sandstone representing the seat of enlightenment in third century B.C. Thereafter, he built a stupa in veneration of the Buddha which remained there upto the second century A.D. The original structure of Mahabodhi Mahavihara temple was completed in seventh century A.D. during the reign of Gupta kings. The temple underwent several restorations, renovations and repairs in the subsequent period in which the Burmese greatly contributed. In 1883, a very thorough and scientific renovation of the temple was done under the supervision of the British Archaeologist Sir A. Cunningham and J.D.M. Beglar and the Indian archaeologist Dr.Rajendra Lal Mitra. In 1956, on the occasion of 2500th Buddha Jayanti celebrations, the Govt. of India did some repair works and enlarged the premises of the Mahabodhi Mahavihara. This is the most sacred place of Buddhist Pilgrimage in the world. In the Temple complex, one can also visit the other seven places where the Buddha spent in meditation after the attainment of Enlightenment. Al these places are situated inside the temple complex. The entire Mahabodhi Temple is built using bricks. This temple is considered as most ancient existing brick temple. The temple has laid foundation for brick construction and it stands as a symbol of fine Indian brickwork. This temple has helped many other temples to follow tradition of brickwork. UNESCO aptly appreciates this grandeur of Gupta period. The main attraction is central tower which stands at a height of fifty five meters were renovated to a great extent in 19th century. There are four other smaller towers which are constructed in same pattern which surrounds central tower. The entire Mahabodhi Temple is covered by stone railings on all sides. The railings depict two different types of architecture. Older railings are constructed in early 150 BC with sandstone, whereas the unpolished coarse granite is architectural beauty of Gupta period. The old railings consist of sculptures depicting Hindu Goddess of wealth, Lakshmi being bathed by elephants and Surya, the sun God travelling on a four horsed chariot. However newer railings have an entirely different collection of figures of garudas, stupas and lotus lower. Mahabodhi Temple earned the renowned distinction of featuring in list of World Heritage Site declared by UNESCO in 2002. The temple complex was completely ruined before it was renovated by British in year 1880. Ancient historical evidences reveal that original temple structure was constructed by Ashoka the great in 3rd century. However, current form of this temple is result of renovation and expansion that took place during the period between 5th and 6th century. But majority of temple structures were destroyed by Muslim rulers who invaded the area during eleventh century. Further, the Bodhi tree which exists in west side of temple complex is not original tree under which Buddha attained enlightenment. The present tree is believed to be fifth successive tree that rose from original one; the earlier trees were destroyed by natural disasters and manmade calamities. Gaya is the nearest airport to this temple located at a distance of seventeen km. There is a flight from Bangkok to Gaya every week operated by Druk Air Lines. Apart from this Thai Airways also has a daily flight to Gaya. In the domestic circuit, an Indian Airlines flight operates on every Friday at 1000 Hrs from Kolkata and returns on Monday at 1500 Hrs. Other airport which is nearby is Patna Airport located at a distance of 110 Km. Pilgrim can take a taxi or train to reach Gaya from Patna. Patna is well connected with national capital by flights. It also has regular flights from other metros like Mumbai and Kolkata. Gaya is nearest railway link to Bodh Gaya located at a distance of 16 km. Regular bus facility and three wheel taxi facilities are available to reach Bodh Gaya. Fare of three-wheel taxi is very much variable and is dependent on time of the day. However, it should not cost you more than Rs 120. Do not show any hesitation in bargaining as a good bargain can save a lot of money. If you are reaching Patna by air then you can take a train from Patna to Gaya. The fare from Patna to Gaya is Rs 34 (Rates in Jan 2008). Following is the duration from Gaya to various important railheads. Currently road from Patna to Gaya is not in good condition, hence train journey is recommended. The main road connecting Gaya and Bodh Gaya is 16 Km long. Tourist buses of Bihar tourism development provide regular bus services from Gaya to Bodh Gaya and back. Buses are also available to nearby destinations like Nalanda, Kathmandu, Varanasi and Rajgir. 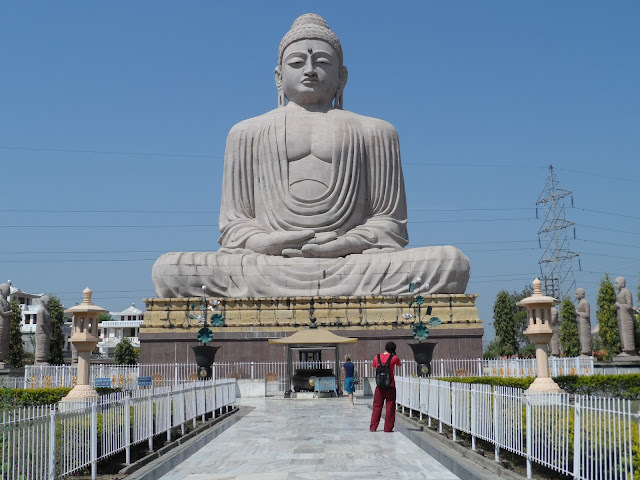 Bodh Gaya can be visited throughout the year. But the best deal is paying a visit in the months between October and March due to the pleasant weather. The Maha Bodhi temple remains open for the visitors everyday between 6 am to 12 noon and from 2 pm to 6.30 pm.